Comments Off on A Grand Sunfish Sensation! 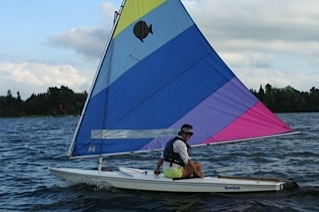 Imagine fifty-two colorful Sunfish sails on the lake at the same time! That is our goal, and we want YOU to be a part of it! 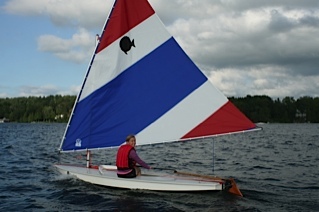 To demonstrate the Sunfish strength in numbers, we are planning to launch and sail our colors just off the Club. This sure-to-be memorable event will take place on Friday, July 10th from 4:00 PM to 6:00 PM, celebrating the occasion afterwards with the Club Fish Fry and music. This is to be a fun and all inclusive gathering. 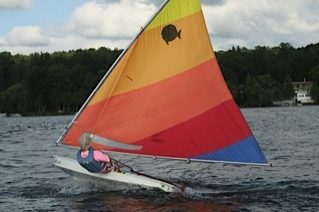 It is open to all WOWs, non-WOWs, and Sunfish owning recreational sailors – yes, even men! On the water, we would like to see the boats concentrated and visible from the Club. To that end, we may set up a simple course between two marks. There could be a starting line and a finish line, but not necessarily a race start. Those not interested in moving around two points may just congregate near the Club. We are open to suggestions regarding how we organize on the water. Beecher Graham and Jeannie Doering and the rest of the WOWs will be organizing this event to make a grand show of the Sunfish Fleet, as we number the most boats of any fleet at Willow Bank Yacht Club – fifty-two!! We will be contacting each Sunfish owner individually sometime in the spring to see who is on board for this spectacular event. We will be on hand to encourage all Sunfish owners to spiff up their boats and participate. We will even hold an advance “help” session a week or so before, to check out rigging and boat parts and generally welcome all participants. For those members too unsure of sailing their boats, we will suggest you allow your grandchildren or other Club members to sail them. We emphasize this will be a FUN inclusive event. Our aim is to have all Sunfish out on the water for this event! !